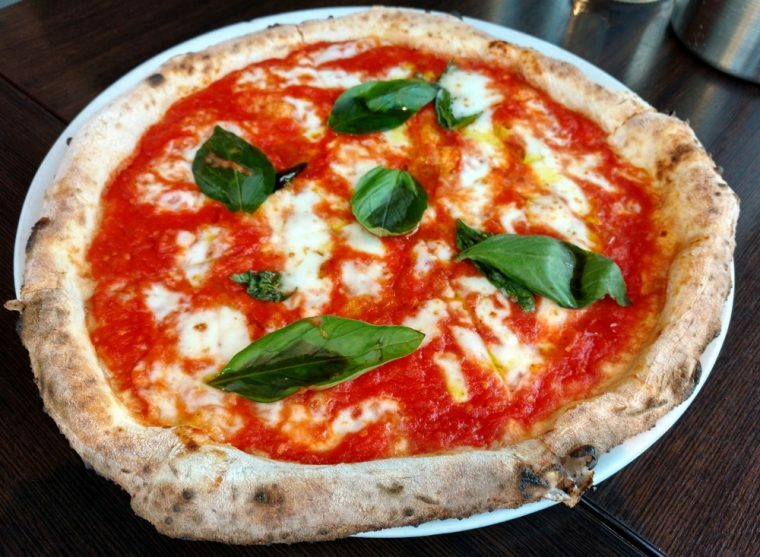 Donna Margherita – Naples in Battersea. I have such wonderful memories of summers spent in the Bay of Naples in my teen years. 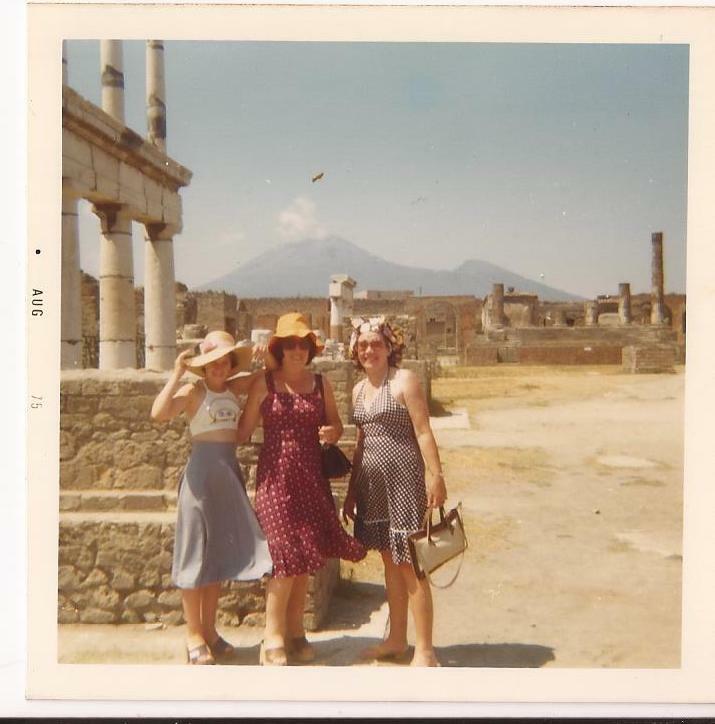 The photo above is me, my mum and aunt in Pompeii with Vesuvius behind us, taken in 1975. The next year we made friends with an Italian young woman called Tina and her cousin Etta, who invited us to stay at their summer apartment which was built on the rocks above the sea between Minori and Amalfi. Steep steps down the cliff lead directly into the sea where their friend the Marquis picked us up in his yacht and took us to Capri; a taste of the high-life indeed. Our friends (the rather handsome Enzo and Antonio) on holiday from Naples were not so wealthy, and arrived in a row boat, together with the large octopus they had just caught. The octopus later re-appeared on top of a large mound of spaghetti cooked by their mother – a dish I shall never forget as it was served whole and appeared to be looking at us! The walk from Minori to Ravello through the lemon groves was amazing, and everywhere we went the people friendly and welcoming, one of the lemon farmers invited us in for drinks I remember. Now famous for the Amalfi lemons, at the time they couldn’t be given away as the thick skins weren’t thought marketable by the supermarkets, and I think spurred on the invention/production of limoncello. 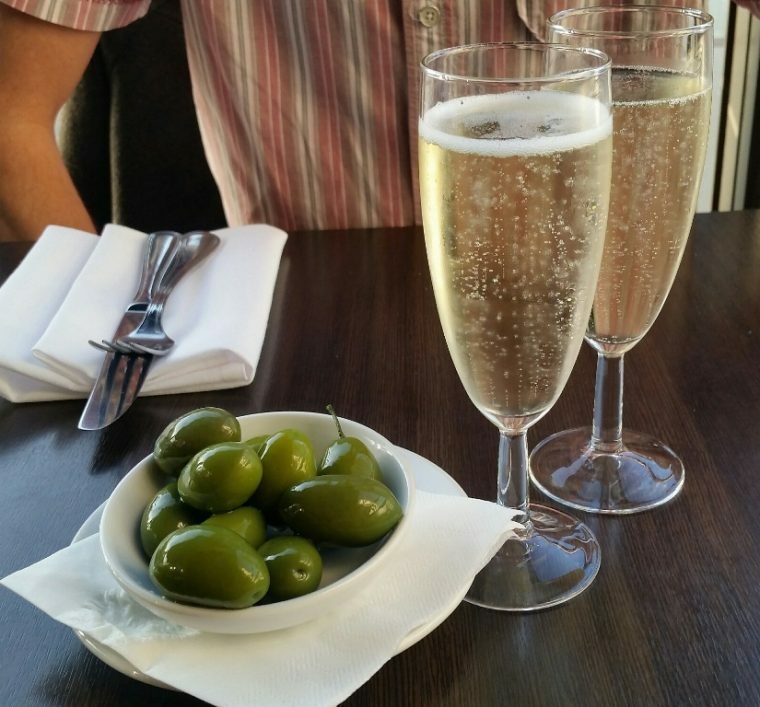 Sipping a chilled glass of Prosecco and nibbling on amazing olives at Donna Margherita brought all that back to me, not least as the table behind us was occupied by a group of Italians talking and laughing in Italian as they shared a meal. It reminded me of the long leisurely Sunday lunches in the courtyard of Tina’s, where dish after dish would appear, and be shared with neighbours. 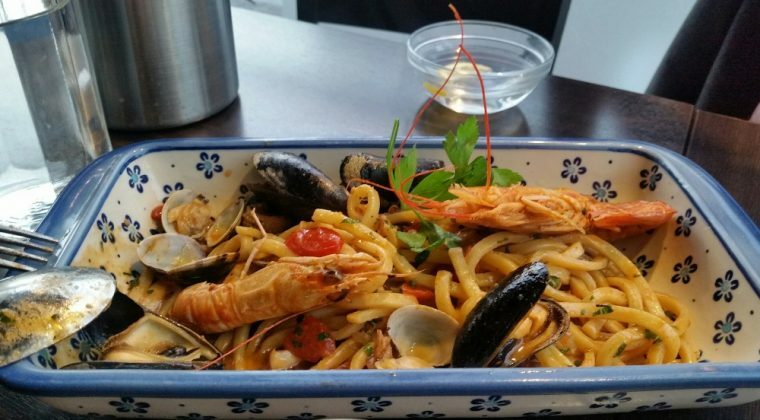 I had gone to Donna Margherita’s with good intentions to order the steamed mussels, and then sea bass in crazy water, but the staff were keen to show us the range of Neopolitan dishes that the kitchen can produce and had chosen our dishes for us. The simple bruschetta was made with good bread, a great quality balsamic, and allowed the tomatoes to be the star of the show. This was followed by a selection of deep fried anti-pasta; arancini, potato croquettes, polenta, and batons of courgette and aubergine. Alex loved the polenta, but the vegetables were the best part of this dish for me. We enjoyed our meal with a bottle of Sevelato 2014, an award-winning Italian white wine. It was crisp, bright and fresh, and perfect for a balmy summer evening. 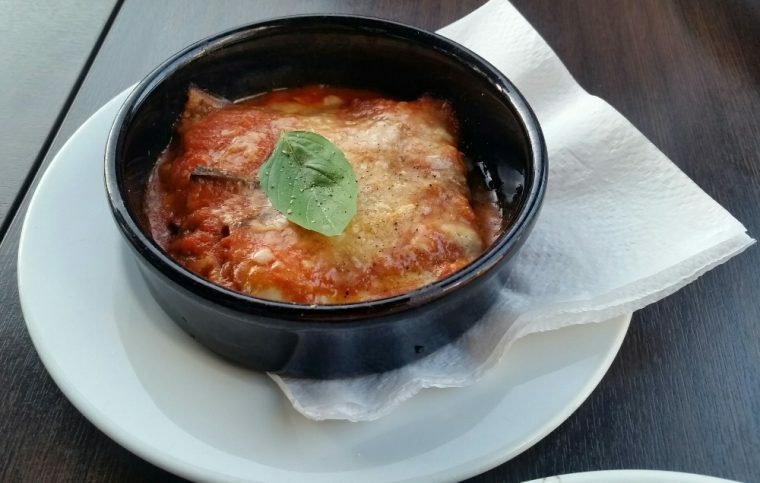 One of my favourite dishes was served next, aubergine parmigiana with mozzarella. A rich tomato sauce set off the perfect smoky aubergines and creamy cheese beautifully. This with a side salad would have been meal enough for me I think! That was not to be! We were then presented with the perfect Margherita pizza, a dish synonymous with Naples. All too often, pizza bases can be soggy in the middle; not so with this one. It was quartered and we were instructed to fold it and pick it up so as to not lose any of the rich sauce. Our next course (yes another! ), was perfectly al-dente homemade pasta with seafood; mussels, squid, cockles, and this contained probably the sweetest langoustine that I’ve ever tasted. It was served family style and again felt really authentic. The whole dish was my idea of pasta heaven! I have to say that I was defeated by this point and only tasted the dessert (Alex was rather less daunted, and ate both portions!). This was like a warm brownie with lots of almonds and possibly pistachios. It was delicious, but I couldn’t manage it! This isn’t a hip place with trendy interior design; it’s a local restaurant lovingly producing fantastic and honest authentic Neapolitan food. It was very busy the evening we visited, and deservedly so. If you live or work in the Clapham/Battersea area, this should be one of your favourite restaurants. This place sounds so lovely – I’m now browsing the menu in hope of some inspiring tomato-free options!